Can trees survive above the current treeline in the European Alps? Are environmental factors that influence spatial patterns of mortality the same as those that influence height growth? Does the relative importance of these environmental variables change over the first 40 years after planting as seedlings? 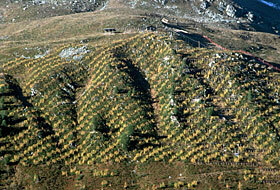 The 5 ha Stillberg long-term afforestation research area is located near Davos (Central Alps, Switzerland). The bottom of the afforestation is approximately at the current treeline and it covers an altitudinal gradient of more than 150 m (2075 to 2230 m a.s.l. ; see picture above). Approximately 92'000 seedlings of three treeline species (Larix decidua, Pinus mugo ssp. uncinata and Pinus cembra) were systematically planted in 1975, and mortality and height growth were closely monitored during the following 40 years. Peter Bebi (2016). Long-term treeline research dataset at Stillberg, Davos. Swiss Federal Research Institute WSL. doi:10.16904/envidat.45.